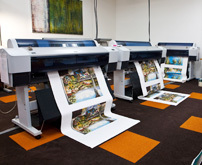 State of the art 64” wide format giclee printers. Giclee canvas and fine art papers. In-house fine art scanning. Custom silkscreens for color enhancement, textures, varnishes, glitters and metallics. UV enhancement available. We offer a large on-line catalog of fine art and decorative art prints (giclees, serigraphs, and lithographs). We can accommodate any size project you have, in addition to offering canvas stretching, canvas gallery wraps and the latest mouldings at wholesale prices. We offer complete warehousing, packaging and shipping. 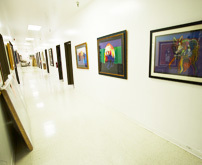 From individual pieces to complete fine art editions, we can provide the necessary logistics. We can drop ship in your name to enhance your brand not ours. We offer unmatched quality and a deep commitment to only producing the highest quality work. We we have access to virtually any substrate on the market. Our canvas and fine art papers are proprietary and, we believe, superior to any of the off the shelf brands used by most of our competitors. Our experience in the art market is second to none. Our master printer, Anne Rumberger, has more than 20 years of experience. Our founder Al Marco, has a proven track record of innovation and excellence in the market. We run a very efficient fine art printing studio for quality control purposes but also to make sure we offer our customers the best pricing available. Our commitment to continually improving our technologies encompasses giclee printing technology, unique application methodology as well as the media on which our work is produced. We have been a leader in the digital printing market and continue to innovate. We maintain long standing relationships with our customers, partners and vendors. These relationships are based on trust and confidentiality. What started out in 1984 as a small print studio in Gardena, California, has grown into an 38,000 square foot building in the heart of the South Bay of Los Angeles. We have become one of the largest specialty printing houses in the country specializing in fine art reproductions (giclee printing) and other high-end reproductions. Twenty-seven years later, we are one of the oldest established serigraph studios in the country, producing the finest quality limited editions for artists and publishing houses from all over the United States. 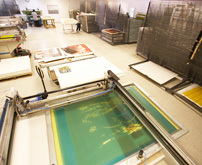 Additionally, MFA has quietly added extensive digital printing technology and is now one of the largest giclée printing houses in the country with unmatched capabilities.